“WHAT THE FRECK”? I Could Not Believe What I Read About My Good Friend Joe.”. What is your tale of Terror and Suspense? I hear my story rising up from the depths. My Silence is sharper and cuts deeper than any two-edged Sword. Power is found in the absence of sound. Enemies and oppressors are enveloped disabled by my calm, quiet in Stillness of being. Sometime around my 52nd Birthday Alien Body Snatchers had taken my normal hour glass figure and slowly began to replace it with a blobbity blob formless mass. I made the excuse that I was becoming Rubenesque like the paintings in the European Paintings section of the museum. Well that was a poor excuse since I’m living in the 21st Century and not the 15th, 16th or 17th Centuries! The Old Age beings from an alternate universe and/or dimensions even had the nerve and audacity to hijack my salt & pepper hair leaving just the salt with no pepper!! My hair had literally turned white overnight!! I even noticed that my formerly Michelle Obama perfect upper arms were beginning to exhibit turkey wing traits!! Ugh!! No!! I will never wear the dolmen sleeves! Evil age inducing extraterrestrials’!! Right then and then I made the choice to reclaim my body. That middle-age spare tire mocked the belly button piercing I had gotten to commemorate my 50th Birthday in 2009! Yes I have and love my Tattoos and piercings. No I’m not going through some middle-age crisis. I consider my body a living canvas and decorate it accordingly. Why should I turn down my self expression? 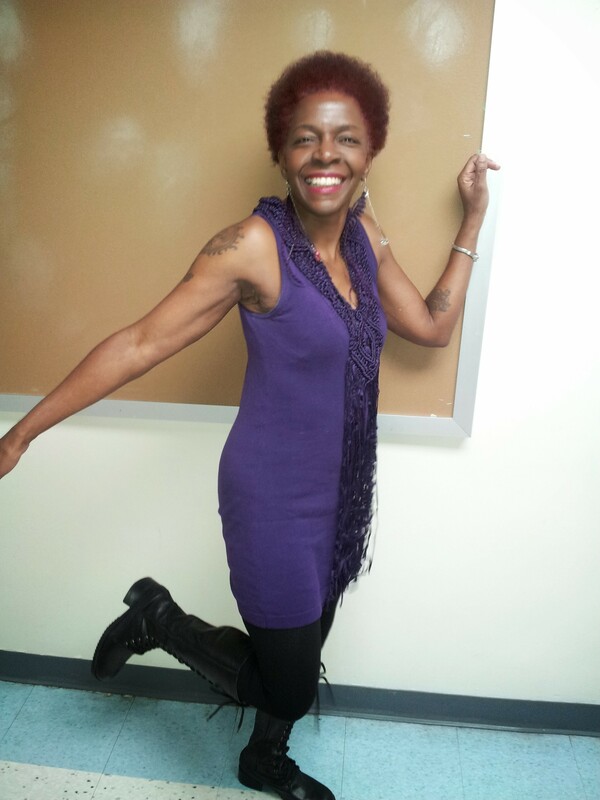 From the Funky 40s all the way to my Fabulous 50s Body Art is the Way to Go!! Made the decision to return to the Summer of 42 not 1942 because I was not born or even thought of that year but Age 42 when I was at my physical peak. I began my unofficial exercise program on Halloween my favorite holiday and my New Birth. Ramped it up in November 2013. I had the good fortune to be invited to a number of Birthday and Holiday parties in November and December and naturally I was on the dance floor at every party! Doing all these regular party favorite dances requires agility and endurance. That’s a workout within itself! Thanks to the Help, Encouragement & Support of two very good friends Matt Velez and Hadiiya Barbel I made my official entry into the Fab Abs Waist Wellness By Hadiiya Barbel program!! Hooray!! Two Major Benefits that I noticed right off the bat were my back pain was 95% gone and no colds or infections since I began the Ab programs. So Dancing is great but Planking, Crunches/Sit-ups, Leg Lifts, Lunges, Stretches, Squats, and Jumping Jacks are even better. As with any exercise program I modify it to meet my needs. I know I have arthritis and bad knees so I do as much as I can but I try to up the ante every day. It’s not really a Challenge if you can’t increase your reps but I do my increases gradually and slowly. I feel that by the end of next month Feb or early March I should have Fab Abs. No New Years resolutions but achievable Fitness Goals!! The Belly Beautiful shall Reign Again!! To all my Abolicious SisterGirlFriends ~ Thanks for Inspiring me to the path of Health and Wellness!! Here’s to an Abtastic 2014!! Red Hair!! Red Lips!! A Fiery Spirit Blazes into 2014! !